Welcome to the gallery of Eva Lovi's images. 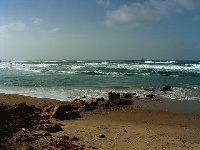 Current exhibit shows, for a change, her digital photographs of Israel's seashore. Here's what she says about the work: "The photo hobby is cheaper than painting. I have started using just my fantasy; it is also a good opportunity to go out in the nature. We have 400 km of sea; only the north part is green, the south is desert; the country is very thin." Click on any image to see its larger version. All images are copyrighted and may not be used without written permission from the artist. If you´d like to see Eva´s previous exhibits and her biography, visit ourArchive. First posted 6/11/99, last updated 9/15/09.